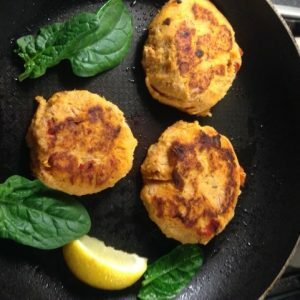 For a healthier protein packed fishcake, why not try making these sweet potato fishcakes, lightly spiced with Red Chilli & Garlic Sauce. Adjust the amount of sauce you add, to create a mild or spicy fishcake. Put the Sweet Potatoes in a saucepan and cover with boiling water. Cook until soft. Drain. leave to cool. Mix the tuna, egg, Jethro’s Red Chilli & Garlic Sauce, and bread crumbs in a large bowl. Mash the cooled sweet potato and add to the bowl of tuna. Mix well. If the mixture is to wet, add more bread crumbs. Heat the oil in a large frying pan, add the patties and gently cook for 4-5 minutes on each side, until crisp and golden.